We cannot give you an SEO quote without looking at your website. First we will need to evaluate your website to review your meta tags, content, code and structure of your website. It all starts with a website. When we build a website we take into consideration your target audience. Therefore, your website is designed to be search engine optimized from the start. However, if we have not build your website we will still be able to help you with organic SEO and Pay per click marketing. We work with you to obtain the highest position that will generate more traffic to your site. We can help you with optimizing your content, your meta tags, social media, Google Pay Per Click services, submission to search engines, article submission, and much more. We can rewrite your content to optimize your website for search engines. We can also help you with email marketing. Each website is unique, therefore all SEO packages are customized to fit your budget. We can guarantee to get your business listed across 50+ high ranking local directories. On page optimization can help with organic search and rank you higher in search engines. Local optimization is a very important part of SEO. Google search is localized. We can help you grow your business in your local area. Meta Tag tell search engine what your website is all about. 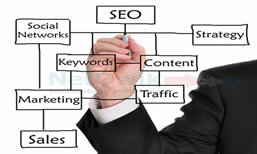 Therefore, if you want to rank higher in search engines you need to optimize them. Search engines like unique content. We can help you and advise you as to how to optimize your content. We also have expertise in Pay Per Click Marketing. Not every visit to your site results in a positive action or sale. But that doesn’t mean you can’t profit anyway! How? By learning about your visitors. We will configure website statistics so that you learn more about your visitor. Know the keywords visitors are using to get to your site! The detailed data can help you target specific customers or create more effective offers. You need the power of Traffic Facts! Get to know—really know—your customers. Get to know how many visits you have! Visit path reporting tells you how customers navigate through your site. Get to know how much time users spend on each page of your website, what is the entry point and what is the exit point! Find out what browsers users are using and their network connections! Find out the location of your visitors! With the vital data you get from Traffic Facts, every visit to your site tells a story! Make informed site design improvements to drive targeted traffic, and increase your profits. Users are looking for your business online. Can they find you? Google Search is localized. Do you know how you are performing with search engines?